The goal of this Web site is not only to tell you about our company, but also to answer your questions about painting and give you lots of helpful information to help you plan your project - whether you do it yourself or hire a contractor. The goal of our company is to provide homeowners and property managers in the Missoula, MT and Kalispell, MT, area with the most trustworthy painting service anywhere. We help you pre-plan your project, we complete it quickly (24 hour turn-around guaranteed for commercial and rental property), and we do a high-quality job using the finest materials. On top of that, we do our very best to make the whole experience an enjoyable one for you. We pride ourselves on quality, workmanship, and communications. As you contemplate your painting project, you might be thinking "Do I really want to do this?" There are a few things to think about before jumping in. A professional painting contractor can offer a level of quality not easily obtained by the average do-it-yourselfer. What's more, painting is labor intensive and at times even dangerous. Exterior painting - indeed, any type of painting - is physically challenging. You need to be fit and capable of performing hard work. You will need to climb ladders at some point. Even small houses will require the use of stepladders and possibly extension ladders. This can be a dirty job - especially if your property is in bad shape. Painting takes a lot of time that you could be spending on something else. If you can handle these hurdles, then go ahead and get started. But if any of them would be a problem, then it's time to call The Painters Express and hire a qualified professional painter! 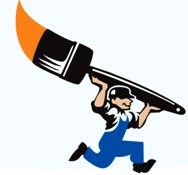 Why Choose The Painters Express? As true professionals within the painting industry, we provide our customers with a dependable and quality painting experience. In the eyes of most people, painting has always been seen as a necessity to protect their investment, but not an enjoyable task to complete. We take a different approach. At Painters Express, we have found ways to take the negativity out of the process. A big part of our secret is communications. We go over all the details of the project with you before we begin, and set up procedures to enable you to follow our progress throughout the entire project. Knowing and understanding the process makes for a more enjoyable experience. We hope this site is useful in answering any questions you might have. Check out the links below to find definitions for painting terms as well as answers to many questions about painting. If you have questions that aren't covered here, please contact us for answers. Also follow the links to get specific details on residential, commercial, or rental-property projects, to find out all the services we offer, and to hear what our customers say about us. Please use the form below to contact us or request more info. * Indicates required field. Please note we respect your privacy! When are you thinking you would like your project started. How did you find The Painters Express?